It took me years to master French macarons, but finally I’ve got it down. And now one of my favorite things to do in the kitchen is experiment with fun flavors of macarons. 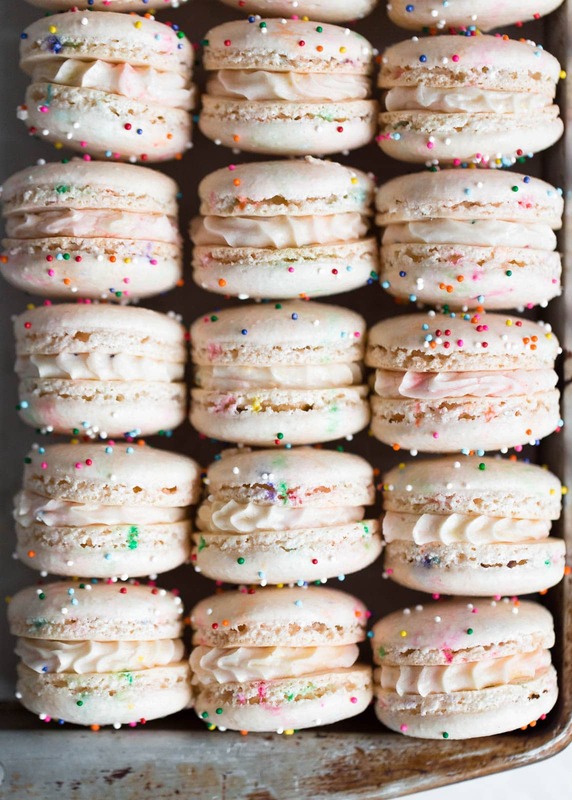 Last month, I came up with these babies: Cake Batter Macarons. And let me tell you, they taste exactly as their name suggests: an eggy, sweet, vanilla-y cake batter. The key is using a regular ol-store-bought cake batter and incorporating it into the frosting. Coupled with a few drops of food coloring and sprinkles for pizzazz, I think they are the cutest and most festive macarons I’ve ever made. Of course, putting these on a birthday cake would be out of this world good. 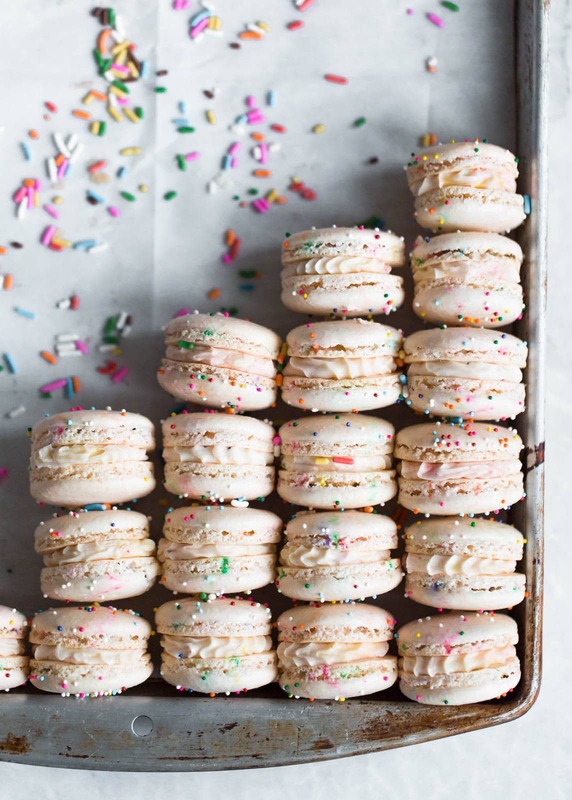 But Cake Batter Macarons are also a great alternative to a full-blown birthday cake. Preheat oven to 300°F. Line two baking sheets with parchment paper. Set aside. Heat a small pot of water over medium heat until it steams. In the bowl of a stand mixer, combine egg whites and granulated sugar. Place bowl over steaming pot, creating a double boiler. Whisk egg whites and sugar until sugar melts completely and egg whites become white and frothy, 1 to 1.5 minutes. Remove from heat and place bowl back onto stand mixer. Fit stand mixer with whisk attachment and whisk on high speed for 2-3 minutes, until stiff peaks form. Congratulations, you just made a Swiss meringue! Sift together almond flour and powdered sugar, then gently shake into meringue bowl. Place bowl onto stand mixer fitted with a whisk attachment. Turn mixer to medium speed and whisk for 10 seconds. Stop mixer and use a spatula to scoop up some of the batter. If you can make a figure-eight with the dripping batter without the batter breaking, you can stop. But most likely you will need another 5-10 seconds. So repeat process, and try the figure-eight again. The best way to describe the perfect consistency is like slow moving lava. It should give, but only slightly, like in slow-motion. Once your batter is the correct consistency, drop in 2 drops of yellow and red food cologing, and swirl it through *only once*. Scoop batter into a large pastry bag fitted with a 1 inch tip. Pipe silver dollar-sized circles onto prepared baking sheets, keeping about 1.5 inches between each meringue. Bang baking sheet on counter two times to remove any air bubbles. Sprinkle tops with sprinkles as a garnish. Here’s the fun part: you don’t need to let them air dry. Just pop them into the prepared oven for 13 minutes, turning around halfway through, then allow to cool completely before removing from baking sheets. While the macarons are baking, make the frosting. In a stand mixer with a paddle attachment, combine all ingredients and whip until light and airy. Scoop mixture into a piping bag fitted with a ½ inch star tip, and place in the fridge until ready to pipe. Once you’re ready, pipe the ganache onto a macaron and sandwich with another macaron. Repeat with all macarons. I think the directions are not for birthday cake macrons. But I can fill in the spaces. I love how they look like little layer cakes! And the filling-perfect. I have been looking for a cream filling for cookies. I know this is it! 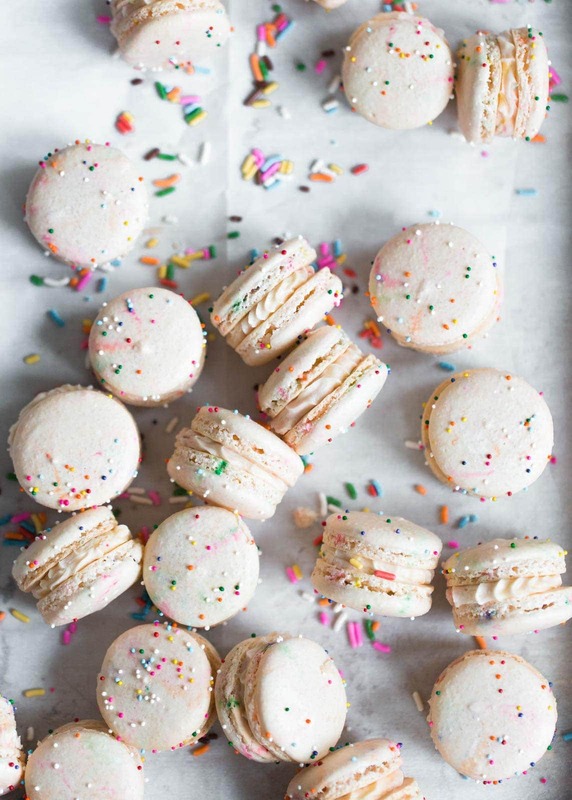 I love making macarons and will definitely give these a try. I so want to make macrons, i’m not entirely sure what’s stopping me though! maybe impending sad, flat macrons? these look so cute and I can’t get enough of your photography! just gorgeous! You make these look so easy! Pretty much down for folding cake batter into evvverything. Mouth = watering! These are the happiest macarons ever! Love all that sprinkle pizzazz! These look PERFECT! I’m sold. When you reference “cake batter” in the frosting recipe – you’re talking about dry mix, correct? Not prepared in any way? Hi Dani! Correct. You will buy a standard boxed cake mix and use that. Hi Sarah! If you don’t have boxed cake mix handy, what’s a good substitute? Thank you! i’m excited to give these a try! I’ve never tried mixing my meringue and dry ingredients using a stand mixer. eager to give it a try! Where do I find cake batter in a box? I’ve got to try this macaron recipe. For years I’ve been using a spatual to mix the macaron batter. Too much work. I Never knew I could use the whisk attachment. It’s just standard cake mix– powdered! These macarons look so cute! How many does the recipe make? The only thing that was a bit tricky was when I piped the batter, it seemed stickier than I’m used to, so it kept making a point when I lifted the piping bag. I had to smooth down each macaron before baking. HI! lovely macs! I was wondering tho, is it 300F fan-forced oven or not? And does it work if i used pasteurised liquid egg whites? Thanks! Hi Claudine! I do not know the answer to your liquid egg whites question. I would probably do regular eggs, separated, just to be safe. And it is a conventional oven, NOT convection oven with fan. Hope these things help, and happy macaron-ing! Yes, 60-90 seconds is perfect. Hello, I had to comment. I have been wasting my life counting turns of the spoon and waiting for macs to dry. I gave up on macarons. I had them explode, had them with hollows, had them look perfect and crack like an egg when I just touched them. I saw your recipe and I said to myself, “it can’t hurt to try it, at least it’s only a half hour wasted not hours of sifting and mixing and drying.” If I could see you I would kiss you!!!! I made 4 macaron recipes back to back over a week. I am so happy I still don’t believe I made perfect macarons every time. You took the devil cookie for me and turned it into my sweet almond angel. My fillings were always great tasting all they needed was a perfect macaron vessel. Thank you again! You are my hero!!!! Hi Wanda! Oh my goodness, what a LOVELY comment to receive!!! It’s totally because of the swiss meringue technique- it takes all that finnicky-ness out of macaron making. Thank you so, so much! Hi, Sarah! Thank you so much for this recipe. This is such a gift since making macarons has always been the frustration of countless macARON fans. I actually made a short video for my group in facebook called- “All Things Macarons – Tips, Tricks, and Techniques” BECAUSE MY CO-MEMBERS NEEDED TO SEE HOW IT IS DONE, THEY COULD NOT BELIEVE THAT IT IS THAT EASY! oNCE AGAIN: THANK YOU, THANK YOU AND MORE THANK YOU! yOU HAVE JUST MADE OUR LIVES MUCH MORE FUN AND ENJOYABLE WHILE MAKING THESE BEAUTIFUL MACARONS. ps- i NEVER THOUGHT I WOULD DO ANY OTHER METHOD BUT fRENCH. tHIS HAS COMPLETELY MADE ME TURN 180 DEGREES. oh my gosh!! After 6 months of attempting to make macarons and always getting hollows, your recipe saves me time AND gives me the fullest, fluffiest macs I’ve ever gotten! My family loves them! You’re my hero! THANK YOU!!! Do we need to work in an AC room? And now it’s monsoon season so is it ok for baking these now? Yes, I would work in an AC room. I don’t live somewhere with monsoon season, but I would think that that would affect the bake time. Let me know how it goes! Hi Colie! If your batter was runny, you went too far in the mixing stage. Next time, mix a little slower! It should go from thicker to thinner, not the other way around. I just tried making these. First time to ever make macarons so I was super nervous. Mine did not have little feet. Just curious if you know what I may have done wrong? ???? Hi Christain! Oh jeez, SO many things could’ve gone wrong. I would look up common macaron mistakes on google to see what your problem could’ve been. 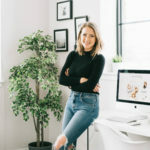 Here’s a link to a helpful article. What would the cream cheese do for the frosting? I attempted this recipe the other day. About half came out as intended the other half had empty shells. But for my first macaron attempt i was rather happy! Lol I do have a question. The cookies were rather sweet. Almost too sweet with the filling. Can I take out some of the powdered sugar? Any advice would be appreciated! Question…. Do you add the almond flour and powdered sugar into the warm swiss meringue? I used this recipe for the first time ever making macarons. And I feel like I have already perfected them in the first try. These are incredibly delicious. Your instructions are perfect. I realized 100g of egg white is about 3 large egg, egg whites. It’s ingenious! I’ve never left a comment on a recipe before but this recipe definitely deserves one. I am in LOVE with how these macarons turned out! They were absolutely perfect on the first try and after having used two other failed recipes, this was a breath of fresh air. I’m glad I gave these delicious macarons a try because I almost gave up on making them. AMAZING. 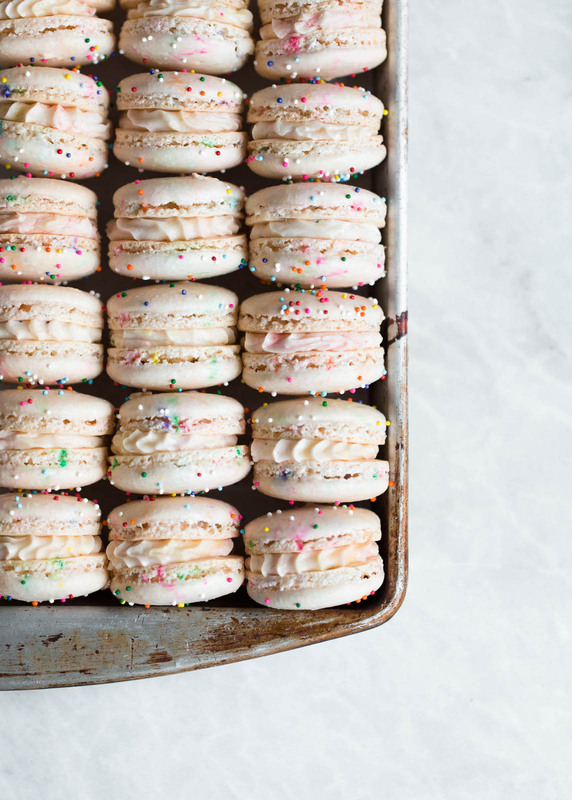 You should be so proud–macarons are not the easiest baked good to master. Happy to hear these worked out well for you! Do you flavor your shells at all? 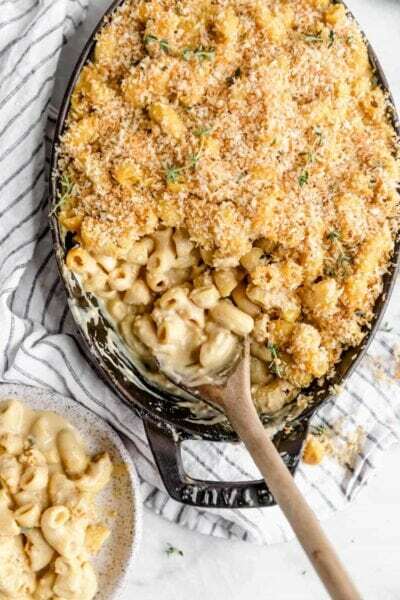 I have never made them this way before ….I love the idea you don’t have to let them rest!! !…These could be a game changer. I do like to flavor my shells though..
For these macarons the filling is really the star flavor! You could absolutely add some vanilla and/or almond extract to the shells here though if you prefer! These look fantastic! Both the macarons and this post are perfect. thanks for sharing with us. Hi Sarah! Thanks for sharing the recipe. I tried it this morning and the tops came out cracked and no feet. Can you point me in the right direction to overcome these issues? Can the number of grams of the ingredients be adjusted as long as the proportion remains the same, e.g., 60 grams of almond flour, confectioners sugar, egg whites and sugar instead of 100 grams of each? Hey Joy! Yes! That should work out just fine if you’re looking to get a bigger batch out of these!